Perform the basic manipulative skills in the areas of hairstyles, hair shaping, hair coloring, texture services, scalp and hair conditioning, skin and makeup, manicures, pedicures, and nail extensions. REFERENCES: Students follow Milady’s Master Educator Student Course Book. Students also have access to a comprehensive library of references, periodicals, books, texts, and audio-visual materials to supplement their course studies. FORMAT: The course is presented through well developed lesson plans that reflect current educational methods. Subjects are presented through lectures, demonstrations, and student participation. Students are tested on competency through completion of required classroom and clinic student teaching activities. There is a 30 minute lunch break. Classes start every Monday and Wednesday at the beginning of each two week period. You never stop learning with Wade Gordon Hairdressing Academy. We’ll help you realize your maximum potential and show you how to draw out that same talent in your students. Being a top cosmetologist doesn’t mean you can teach. Wade GordonHairdressing Academy makes sure you have the skills you need to share your cosmetology prowess with your students. 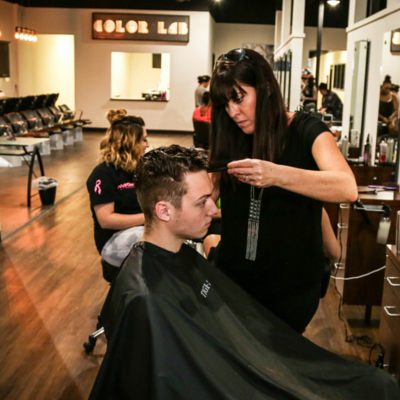 If you learned from a different cosmetology school, you can feel confident that Wade Gordon Hairdressing Academy will fill in any skills that you may be missing. Graduates are not only teachers, but brilliant cosmetologists. You may not realize how different cosmetology students can be. Wade GordonHairdressing Academy prepares you for every student. We help you get the best results in the least amount of time. Schedule a tour of Wade Gordon Hairdressing Academy to get a glimpse of your future.